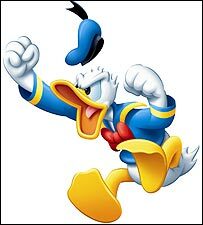 -- with due regard to "the Mickey" -- I'll not be carrying water for "the Donald." The performance of one of my Shimano RSX 7-speed STI drop-bar brake/shift levers slowly deteriorated, requiring multiple clicks for each downshift. This apparently is a common problem. Someone at a bike shop once told me "they never work." I just lived with the problem until the lever stopped shifting gears at all. A web search turned up information that Shimano STI levers are difficult to work on -- no kidding, have a look at this disassembled one! Apparently, the most common problem is that the factory lubricant gums up. There is advice on the Web to free up the mechanism by soaking the lever in solvent or squirting solvent into it. If you're going to try this, remove the rubber hood first, or it will absorb solvent and expand. Relubricate the shifter with lithium spray grease. Internal parts can wear out quickly if not fully lubricated, according to the expert in repairing these levers. You could spray in the grease from every possible direction and still not be sure it reached everywhere it needs to go. Also, it's hard to get all the old, gummy grease out without taking the lever apart. Or, the lever might have a different problem. 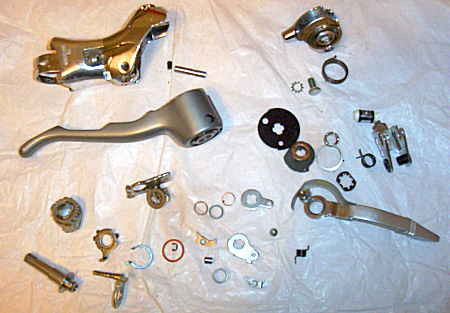 There is information online about rebuilding 9-speed levers, here, and there is a photo album of disassembly of an Ultegra 9-speed lever here -- unfortunately without instructions. 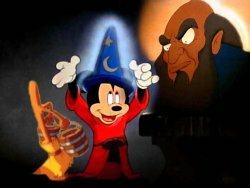 Are you convinced yet that this is a job for a real Wizard? To arrange a sure and long-lasting repair, you may . He will disassemble, clean, lubricate and reassemble a 7- or 8-speed lever for $30 US, or $50 for a pair. He sells levers on eBay, and he buys up levers and takes trade-ins. His eBay user name is eeforme. Jim does not work on 9-speed levers (they're too unreliable), or on mountain bike levers or Sora levers. You might also check whether your lever is still under Shimano's warranty. 9-speed levers are, in any case, also available new, while most 7- and 8-speed levers have been dropped from production. Harris Cyclery does have new 8-speed STI shifters for sale --and 8-speed bar-end shifters, too. To remove a lever to send it out for repair, first disconnect the cables at the brake and derailer, so you can pull them out through the lever. There's no need to remove handlebar tape unless it has been wrapped over the lever's rubber hood. Unscrew the handlebar clamp bolt to remove the lever from the handlebar. The clamp bolt is recessed into a groove in the outward-facing side of the lever body, under the rubber hood -- not inside the lever body as with most brake levers. You will see the groove if you turn down the upper edge of the rubber hood. Once the clamp bolt is loose, you can just lift the lever off. You can leave the brake-cable housing, handlebar clamp and tape in place on the handlebar. When replacing the lever, first reinsert the brake cable into the lever and thread it into the cable housing. In case you need to install a replacement brake cable housing, see advice here. Then position the lever carefully over the handlebar clamp and tighten the clamp bolt. Getting the lever into place is easier if you roll up the bottom of the rubber hood like a trouser cuff. Pulling the brake cable at the other end will help guide the lever into place over the cable housing. Finally, reinstall the shift cable -- detailed instructions are in the article about cables -- adjust the brake and derailer, and arrange the handlebar tape and rubber hood.